Restore the beauty of your home with Cuprinol paints. Get them at very affordable prices at Wilko, Amazon, and other UK retailers. Check the Latest Deals site frequently to know about the latest Cuprinol paint offers and bargains. Our savvy money-saving experts will provide you with useful tips for you to save money. Cheap Cuprinol deals from popular UK retailers would likely be on top of your options but you can also look for other great offers. There are countless Cuprinol products to choose from, depending on what you are looking for. Find the best Cuprinol deals and voucher codes here at Latest Deals! At one point, your garden becomes the extension of your home. It is useful in holding other activities that make your family and friends bond. You may not know it but it can also improve the quality of your life. It is the space where you can play, dine, relax, entertain, exercise and even work. Thus, this personal sanctuary should be treated with nothing but the best, and this is when Cuprinol comes to place. Cuprinol is determined to make your garden even more special. It seeks to improve yours so that you can find that area effective for relaxation and unwinding. Furthermore, it can also encourage creativity, productivity and enthusiasm in you. These are indeed promising. From time to time, Cuprinol improves the services it offers. As a matter of fact, it has worked with professionals including Creative Director Marianne Shillingford and Lily Bernheimer to better understand the advantages of going outdoors. That uncovers how precious your garden is. The services of Cuprinol are crafted by expert teams to serve as an inspiration to various homemakers all over the world. This is why transformation is just around the corner. It is never too late to see the potential of your garden. Rain or shine, this can be achieved! 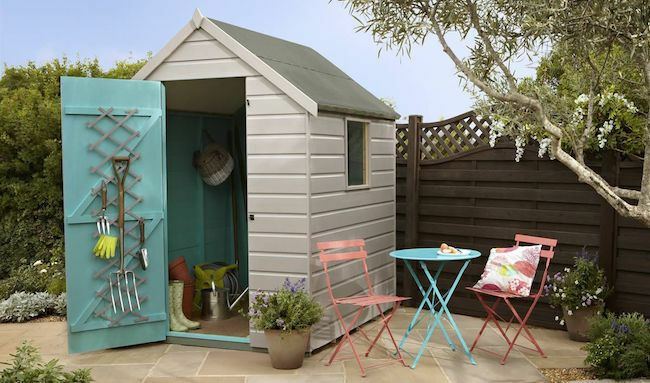 It is crucial to protect your garden fences, sheds and furniture as much as you can. At the end of the day, this space should still be given the love that it deserves. It should be cultivated most especially that seasons change. Good thing, there are natural and colourful wood care products that you can explore. These are bound to protect and inspire. To be in harmony with gardens. Cuprinol Garden Shades. This is a water-based garden paint that can resist any kind of weather. It is ideal for all types of exterior wood. Use it for fences, sheds and garden furniture. When you do so, you will allow the natural texture of the wood grain to show and shine. After an hour, you can expect it to dry. That can last for almost six years. How good of a deal is that? Cuprinol One Coat Sprayable Fence Treatment. If you have pets and plants that you want to protect, this spray fence treatment is perfect for you. It is water-based and it works well for fences and sheds. Moreover, it is used to protect and colour rough sawn timber. If you have a problem relating this, this spray should be okay for you. Cuprinol Anti-Slip Decking Stain. If you are in need of protection from green algae and mould growth, this Anti-Slip Decking Stain is the answer. This wears a long lasting weather protection that you can outmost. Furthermore, it also contains anti-slip microbeads so that your decked areas become even much safer. The finish is semi-transparent. Cuprinol Ultimate Garden Wood Preserver. The Cuprinol Ultimate Garden Wood Preserver is a wax-enriched, water-based wood preservative that is efficient for your garden timber. This can be for summerhouses, garden gates and fences. Once you use this, you can have protection for five years. Apply this to all types of planed or rough wood. Cuprinol 5 Year Ducksback. 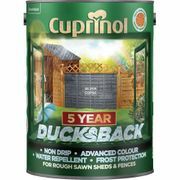 The Cuprinol 5 Year Ducksback is a water-based, water-repellent wood treatment. It is bound for garden fences, sheds and rough sawn timbers. It is a wax-enriched formula that can give you almost five years of protection whatever the weather may be. This non-drip formulation is convenient for application. There are plenty of ways to save on your purchases online. 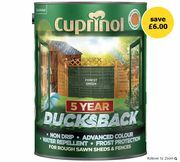 Most online UK shops such as Amazon, eBay, and Homebase have regular sales, seasonal clearance, and flash sales where you can get up to 50% off on a wide array of Cuprinol garden shades, white fence paint, green fence paint, and Cuprinol shed paint. There are even retailers that have 3 for 2 and 2 for 1 offers on select items. Also, the best time to get huge savings is during Black Friday, Cyber Monday, and Boxing Day where an extensive selection of products like Cuprinol seagrass, Gloss paint, and fence paint colours from your favourite UK retailers are reduced to clear. Knowing when and where to look for the lowest possible price on cheap fence paint, fence paint sprayer, and garden paint is the key here. Fortunately, you don't have to spend hours online searching for special offers, bargain deals, and price drops on Cuprinol wood preserver, and Cuprinol decking paint. Our massive community of bargain hunters regularly share verified discounts, promos, and voucher codes from Screwfix, Tesco, and Wilko, and from other reputable shops across the country. We also have a team of money-saving experts who always share essential tips and tricks on how you can get every day low prices on Cuprinol deals, and cheap Cuprinol when shopping both online and instore. Getting additional money off with the help of Latest Deals is easy. You can maximise your savings by simply using the latest Cuprinol discount code of your choice upon check out. There are also voucher codes that can provide you with free shipping and gifts. Utilise composted yard waste. The truth is, not all materials are created equal. You cannot expect them to decompose at the same rate. This is impossible. As that is the case, you have to be sure about the conditions of your compost pile. That is a must. Stay away from yard waste that only harms sensitive plants. Get rid of bugs. Insects always damage plants. They do as compared to cosmetic. When that happens, bacteria and viruses enter a plant. This occurs through an opening. There are instances when the insects serve as the transport for these viruses. That is when they spread from one plant to another. In order to avoid this, make sure that you do not have bugs in your garden. Properly examine your plans before buying. In order to restrict disease in your garden, you should prevent the introduction of it. No one wants this as a bonus, of course. You can start by collecting magazines, books, and catalogues so that you know how a healthy specimen is. As much as possible, do not keep plants with dead spots. They can mean trouble. Clean up regularly. Regularly here means you clean up in the fall, if that is applicable to you. It doesn't even matter if you are from a moderate climate, you should still follow this. Doing so is not only an effective deterrent to any sort of disease. It is also a good way to control any type of sickness that can infect your garden.